You remember that time...the timid, furry little creature inching closer with a tiny spear that seemingly couldn't hurt a fly. The space princess, just knocked from her stolen speeder bike..being perused by the Empire and on high guard, but certainly not wary of this little teddy bear native of the forest moon of Endor. Were this a Syfy Saturday night film, the encounter would have ended abruptly when Leia offers up some food and the tiny beast lunged for her face...teeth bared and claws extended. Sadly, this is Star Wars...and while I do love Star Wars something fierce, I love the thought of the reality of the humanoid eating Ewoks even more. FEAR THE LUKA LUKA SONG!! 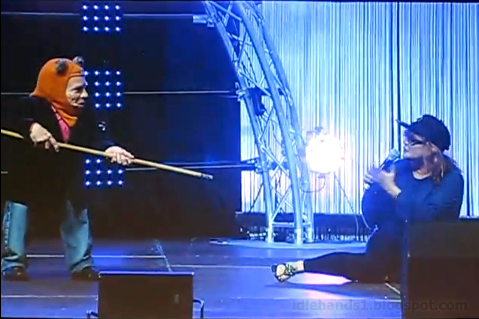 Recently, during Celebration Europe, Warwick Davis (AKA Wicket W. Warrick) and Carrie Fisher (AKA Princess Leia Organa) took the stage and reenacted their first encounter from Return of the Jedi with hilarious results. I say Davis ditches Karl Pilkington and travels across America with Carrie Fisher. What say you? Hit the jump for the video!